WASHINGTON -- Republican presidential candidate Donald Trump says he saw people cheering the Sept. 11 attacks across the river in New Jersey - a claim officials strongly deny. "I watched when the World Trade Center came tumbling down. And I watched in Jersey City, New Jersey, where thousands and thousands of people were cheering as that building was coming down. 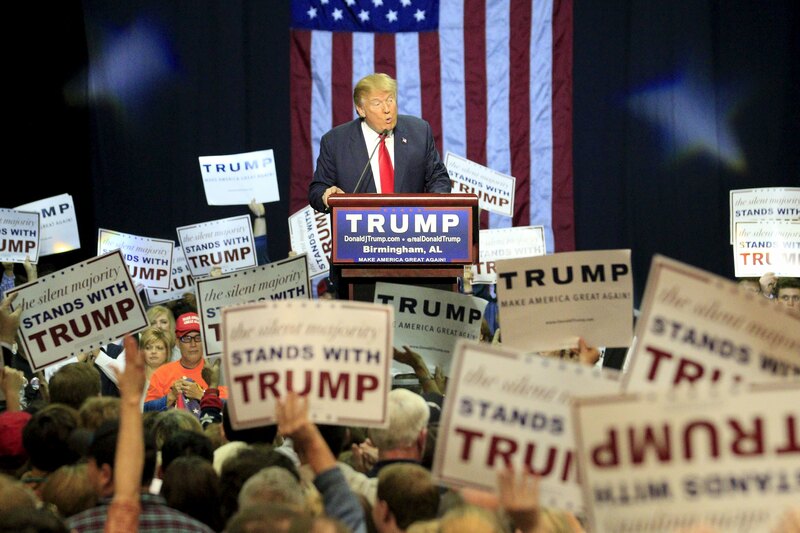 Thousands of people were cheering," Trump said Saturday at a rally in Birmingham, Alabama. Trump repeated the assertion Sunday in an interview with George Stephanopoulos on ABC's "This Week," as Stephanopoulos explained to Trump that police had refuted any such rumors at the time. "It did happen. I saw it," said Trump. "It was on television. I saw it." "There were people that were cheering on the other side of New Jersey, where you have large Arab populations. They were cheering as the World Trade Center came down," he said. "I know it might be not politically correct for you to talk about it," he added, "but there were people cheering as that building came down, as those buildings came down. And that tells you something." A spokeswoman did not respond to a request for clarification Saturday about Trump's comments. In a statement, Jersey City Mayor Fulop criticized Trump for his statements. "Trump is plain wrong, and he is shamefully politicizing an emotionally charged issue," said Fulop. "No one in Jersey City cheered on September 11th. We were actually among the first to provide responders to help in lower Manhattan." "Trump needs to understand that Jersey City will not be part of his hate campaign," said Fulop. "Clearly, Trump has memory issues or willfully distorts the truth, either of which should be concerning for the Republican Party.'" "Not sure what luxury spider-hole @realDonaldTrump was hiding in on Sept11 but I saw Americans come together that day @GStephanopoulos," he wrote.